Even if you can’t spend the summer relaxing at your country house, svekolnik and mors will make you feel like you’re relaxing in Russia. When you live in Moscow, your life is very closely tied to the weather. From the end of September to about April, it’s about staying indoors and eating warm food. The rest of the time (well, when it’s not raining) the thought on everyone’s mind is “we have to enjoy this weather while it lasts!” Then there are six to eight weeks in July and August when the temperatures are almost too hot to bear, and that’s when cold food, soups and drinks come in to play. Russians like soup so much that even when it’s 80⁰F we can’t imagine a meal without them, so we came up with some cold ones. Svekolnik is among the most popular, since it’s made from beets – just like borscht. I must confess that for a very long time I didn’t really consider svekolnik worth eating. It appeared only for a very short time during the summer months and usually when I was on vacation. Plus, it was just a lesser version of borscht! Now, however, I really enjoy it. It’s cold, fresh, healthy and refreshing. And the cucumbers in make me think of Pimm’s lemonade, but it goes well with traditional Russian cranberry mors, too. I recently found out my great-great-grandmother used to always keep a barrel of marinated beetroot in her Kiev house just to make svekolnik. This was in before the 1917 Revolution, so she had a house with a basement that was filled with barrels of beets, cabbage and cucumbers. However, my great-grandmother must not have shared her mother’s love for svekolnik. I didn’t grow up eating it and so I don’t have a family recipe to share. But I wanted to try this soup, so I turned to the “Book of Healthy and Tasty Food.” This book, which first came out in 1939, was the go-to recipe book for all Soviet families. I looked for recipes online, too, but they all suggested frying the beetroot with onions, and I’m not keen on frying ingredients before adding them to the soup. So I chose the Soviet version and it turned out great: just as fresh and healthy as it should be. 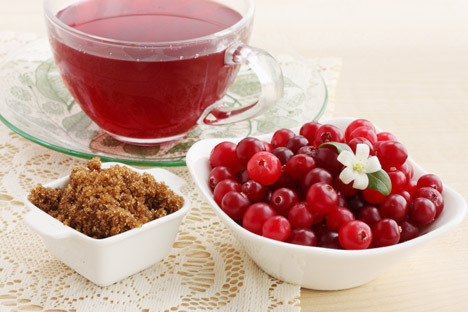 As for mors, it’s a drink popular throughout the year, but in summer it’s particularly nice since it can be made with fresh berries. I think the best way to drink it is at a dacha with a fresh salad, cold soup and shashliki (Russian grilled meat skewers). I don’t think that Russians are the best at handling the summer heat, but we do have some great summer treats and I hope you enjoy them. 2 boiled potatoes or apples cut into small cubes can also be added, depending on your preferences. 1. Wash beetroot (very thoroughly, as you will use the stock as a base for the soup) and boil it until it is soft. Add lemon juice. I add it towards the end so it doesn’t affect the cooking of the beets. 2. Remove the beetroot; cool and strain the stock. Peel and chop up the beetroot. 3. Add sugar, cut up the egg white (I add the whole egg), lettuce and spring onion, cucumber cut up into small pieces and add sour cream. 4. You can also add boiled potatoes or fresh apples. 1. Mash cranberries in a pot, add cold water and boil for 5-10 min. 4 cups cold water; 2 Tbsp honey; 1 cup fresh or defrosted cranberries. 2. Turn the heat off and leave mixture for 1-2 hours to cool. 3. Strain liquid, add honey and mix thoroughly.